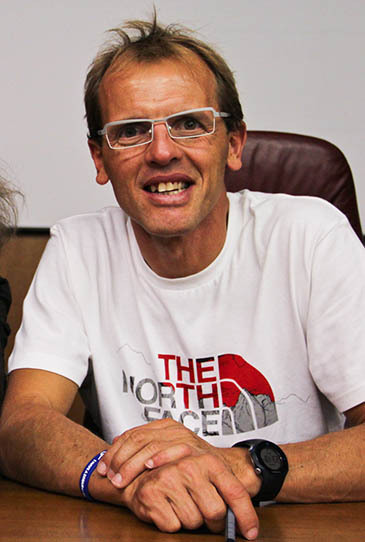 One of the men involved in the recent ugly confrontation on Everest between three European mountaineers and Sherpas has carried out a daring helicopter rescue of a stricken climber. Italian climber Simone Moro flew his aircraft to a record-breaking 7,800m to airlift the Nepali-Canadian casualty from Everest’s South Col yesterday. 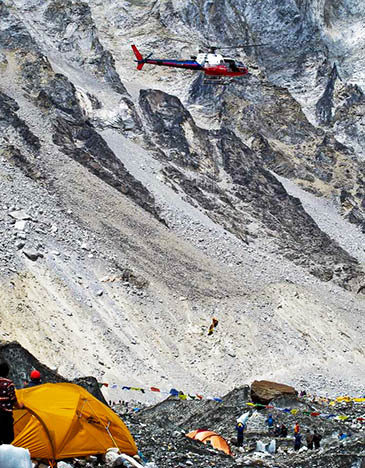 It was the highest ever rescue by helicopter. The rotary-wing aircraft struggle to gain uplift in the thin air at such altitudes, but Moro piloted his machine higher than any previous flight so the injured climber could be brought to safety. The rescue was witnessed by David Hamilton, an expedition leader from Sheffield-based Jagged Globe. He said: “An injured Nepali-Canadian climber was lifted on a long-line from 7,800m on Everest at 1.30pm Nepali time on 21 May. “The climber got into difficulties in the afternoon of 20 May high on Everest. “A Sherpa team led by Pasang Tenzing, who was working for Jagged Globe, rescued the injured climber from above 8,500m in the evening reaching the South Col Camp at 7,950m at 8pm. “On 21 May they lowered him over several hundred metres of difficult ground to reach a spot from where the record-breaking helicopter pick-up was possible. Mr Moro was with British climber and photographer Jon Griffith and Swiss speed-climbing expert Ueli Steck last month when they were confronted by a group of angry Sherpas who took exception to their Alpine-style climbing in an area where the Sherpas were fixing ropes. The European climbers said their lives were threatened and they had to make a dangerous escape from Everest Camp Two back down to Base Camp. Griffith and Steck flew out of the area after their expedition was abandoned, but Moro remained in the Everest area. "Italian climber Simone Moro flew his aircraft"
I wonder how long it will be before climbers on the Ben will be asking for a helipad and parking at the CIC hut. just a few weeks ago, Moro/Steck/Griffiths fell victims to one of the most disgusting events in mountaineering history. Nonetheless Moro keeps on doing his brave rescue maneuvers on everest - big respect! The Everest commercial circus certainly has its followers. There will be days where rescues @ this altitudes cannot be performed, on good days may be higher altitudes are possible. I just hope for that the public climbers don't start to think this will becomming standard rescue. Its very dangerous, and the hero today can end to zero tomorrow. Watch out your back Simone and keep aware, i know what I'm talking about. Fantastic flying- good show Simone! A guy with 1000h, the most on double controls, flew up to this altitude for a resceue (With a landing) ??? you will get into heaven...by Helicopter!! How can this person, Simone take the credit for a very skillful rescue? Dear Steven, Jesus and Maddog, Simone NEVER said he was the pilot!! My comment relates to this article. You really should have worded your earlier comment better. "How can this person, Simone take the credit for a very skillful rescue? Let the pilot that flew the aircraft take the credit..."
The answer is that he didn't take credit for piloting the helicopter. In the Planet Mountain interview he said that Folini was the pilot, and he was one of the crew members. Yes truthteller...how thoughtless of anyone to comment on a published news article. Was Moro even on board at the time ('one of the crew members')? I very much doubt anyone was aboard but the pilot and a few litres of fuel.